A match made, as Alternative Finch collaborates with Helena Eloise. With a collection of deliciously dark jewellery, Alternative Finch have been adding the perfect finishing touches to many an alt outfit. Everything from gothic couture, to the macabre, and even a touch of rockabilly can be found amongst their designs, with a wonderfully varied range of dark alternative pieces that have been showcased in a perfectly fitting fashion in their latest shoot with photographer Helena Eloise. 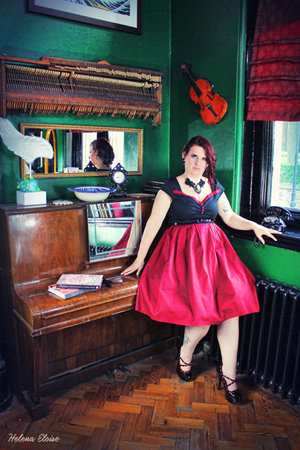 Alternative Finch is the creation of designer Debbie Finch, who has been making jewellery since 2010, and started her own business in the summer of 2014. 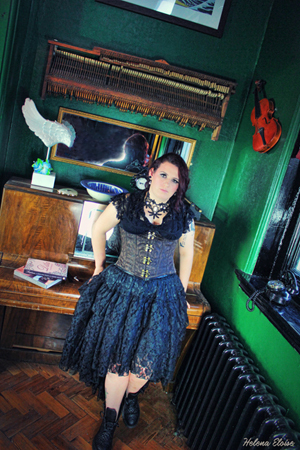 Taking a pinch of inspiration from gothic & alternative clothes and music, to create her stunning designs. Alternative Finch first worked with Helena Eloise after holding a stall at a Fetish Rocks night - an alternative multi media event run by Helena and held at the Old Courts in Wigan. Debbie modelled her jewellery for the first time last Christmas and commissioned Helena to take some shots in the studio that show her unique jewellery designs off in a lavishly dark alternative style. 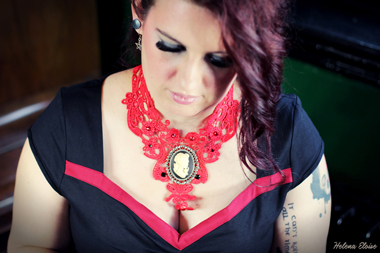 "I very recently commissioned Helena again for a location shoot (at The Old Courts' Green Room) with myself modelling my jewellery, this time modelling my chokers. I am very pleased with the final edited images that Helena created. I think that the ornateness of the room compliments my chokers and my outfit excellently. I plan to collaborate with her again in the near future" says Alternative Finch designer, Debbie Finch. You can snap up a piece from Alternative Finch online, where you can find a wide range of alternative jewellery and accessories, alongside kindle, iPad & iPhone cases. 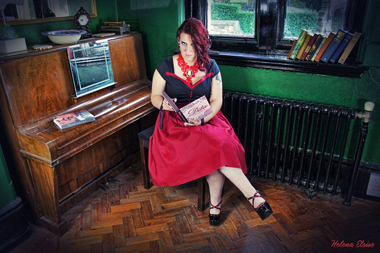 You can also find her trading at steampunk markets and alternative fairs in Lancashire and Yorkshire. Alternative Finch will be trading at the next Fetish Rocks in the Bailiff Bar at The Old Courts in Wigan on 29th of October - For more details visit: The Old Courts. Visit the Alternative Finch shop at Etsy - www.etsy.com/shop/alternativefinch, and find out more about her designs at www.facebook.com/debbiefinch80. Image credits: Photographer/Hair/MUA and styling: Helena Eloise - www.helenaeloisephotography.com | Model/Jewellery: Alternative Finch | Location: The green room in The Old Courts, Wigan.